When it comes to fun and exciting experiences, Absolut is king in turning ordinary nights into unforgettable ones. The Absolut brand’s passion for nightlife, love for thrill, and embrace of all things bold and electrifying has been translated into their Nights by Absolut campaign which Outform was lucky enough take part in (take a look at our amazing Travel Retail 3D Pedestal here and Bottle Glorifiers here). Outform was once again tasked with channeling the spirit and energy of Absolut’s campaign into a retail display that would wow and amaze…and we delivered. When designing the display, the Outform team took cues from the alluring glow of dance club lights, the full-throttle energy of nightlife, and lasting memories of celebrations to fit with the campaign. The result? The Absolut Standout Retail Display – a visual-spectacular with a shimmering sequins finish, large family of Absolut vodka, and grand in-store presence that’s impossible to miss! The display is branded from all four sides, creating a full 360 shopping experience for customers, and features the iconic Absolut bottle silhouette, giving an extended in-store brand presence to really get the party started! 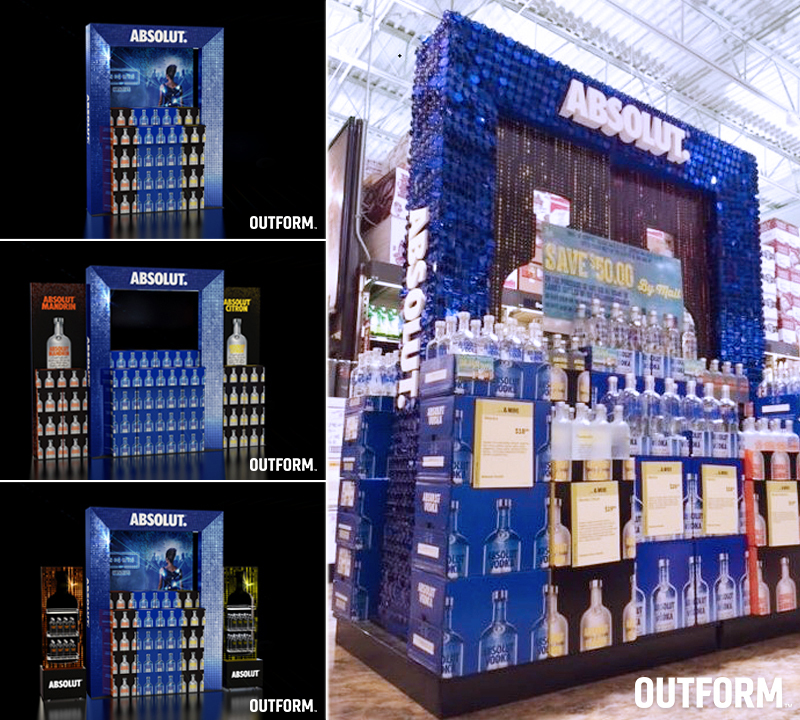 The Absolut Standout Retail Display will be out in Total Wine & More stores, so keep an eye out. Here’s to another exciting display from Absolut brought to you by Outform. Cheers! Find out more about the Absolut Standout Retail Display here.